How to Get Around in Venice - The Chip's Challenge Wiki - The Chip's Challenge Database that anyone can edit! How to Get Around in Venice is the 71st level in Chip's Challenge Level Pack 3. It was created by Joshua Bone. 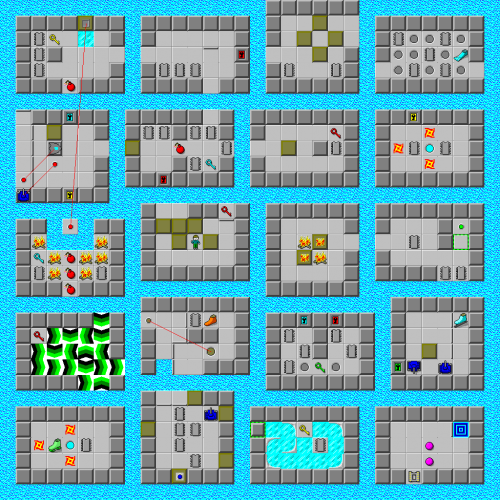 393 route: Use the blocks to reach the red key, then bridge to the glider clone room, press the red button (which will clone a tank which clones a glider – only 5 gliders can be cloned), follow the glider and collect all chips apart from the rightmost one, as well as the blue key. Clone another glider and open the blue door. Move the block R, then clone another glider and push the block into the water. Glider 2 will explode the bomb – collect the yellow key and 3 chips. Clone another glider and open the yellow door. Dodge glider 3, and push the block cloned by glider 3 into the water, retreat to dodge glider 4, then collect the 3 chips in the next room. Move the next cloned block 6R D, then clone the final glider and push the block into the water. Collect the chip, and push the block cloned by glider 5 into the water immediately to the right of said chip. Collect another chip and a red key, and push this block into the water immediately past the red door. Use the blocks to reach the recessed wall room. Collect the chips here and the flippers. Move to the room at the bottom with the tank. Push the lowest block U (there is a blue button under this block), move block 2 2L, then push block 1 into the water and follow with block 2 (aiming to reach the brown button). Follow with block 3, then block 5, exiting the room by pressing the blue button twice (so that the tank is at the top). Push block 4 3L before pushing block 5 into the water, then push block 4 onto the trap button. Collect the fire boots and chip, then collect the leftmost chip in the green button room, so that the blocks in the room to the left can be used to hit the green button without Chips being trapped. Get the yellow key from the now-opened ice room. Go through the yellow door into the fireball room, and collect 3 chips and suction boots from this room and the other fireball room (through the teleport). Collect 2 chips and a blue key behind the fire just below the glider cloner, then the red key in the force floors, then collect the green key and 5 chips via the blue and red doors. Go through the green door, move the block U L, flip the tanks (using the blue button in the bottom room), collect the skates, get the final chip (in the ice room), and dodge the pink balls to reach the exit. This page was last edited on 13 March 2019, at 01:10.